We’ve been fortunate to have Matt Biddulph around Amsterdam a lot recently. Describing himself as a creative technologist and freelance software developer, tonight he spoke to an intimate audience at Mediamatic about programming self-replicating bacteria in Second Life. Here are some notes. Spimes have identities. They know their origins, locations and best uses. First spimes will exist in the virtual world. They will begin on the computer screen and from the drawing board. Spimes will then get to the physical world through 3D printers, which are getting more affordable and are ubiquitious in design practice and industry. They can easily take objects from the screen to realization before the investment and risk of massive production runs. Spimes allow the tracking and optimization of cradle to cradle object lifecycles. With a search engine of all objects, you can track the progress of objects and repurpose and assign them to where they are most needed. So the universe of spimes is an informational universe. The logical first step in creating spimes is creating them as pure information. Where better to do it than Second Life, the online world, a system we can use to understand the operation of digital objects. Second Life is an environment where you can make things. Every object is made by users. It isn’t a narrative experience like World of Warcraft. And every object in the virtual world can have a script attached to it. The first bit of Second Life hacking Matt did (with nice video) was to take the API from Flickr and feed it onto the surface of objects in Second Life. He took data from the 2D web and put it into the 3D virtual world. You could call up a subject or object through a Flickr tag and have the most recent picture projected onto a virtual object. Matt was then contacted by the esteemed Nature Publishing Group to conceptualize and derive centers of sociality for the scientists in their readership. The goal was to start and maintain conversations amongst scientists. Every scientist has seen a 3D visualization of a cell, but none have been able sit in them and walk around them. Matt realized that the tomography software that models cells is inaccessible and expensive. If only you could model cells in Second Life, you could facilitate widespread interaction around virtual scaled-up models of cells. It turns out that scripting and making things in second life is quite easy. You can set up an object that is self-replicating. He compared the process of making objects in Second life to Mickey Mouse conducting in Fantasia. You sort of send objects off and so it’s easy to physically lose a piece of code there. Sometimes you lose objects in second life, never to be found again! He started working up from a polygon to more complex shapes. Inspired by Quake, which is now open source, the first test rendering was taking the quake character into the Second Life world. He showed of video of the character from quake coming together triangle by triangle. Second life puts a delay on self-replciation to prevent the ‘grey goo’ situation of Stephenson where we are chocked to death by dead biotech descending from the air. Every object in Second Life is subject to slowdown. Now on the Island of Nature.com, called ’second nature,’ you can press a red button that begins the self-replication of your chosen cell. You can then convene and interact with people around it as it forms and floats in mid air. Cool. 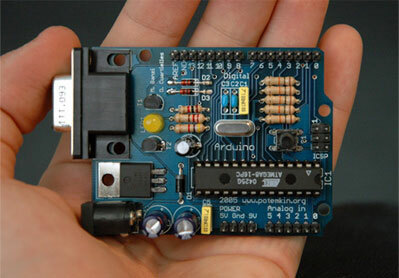 Coming back to subject of Spimes, Matt mentioned Arduino, the open source all purpose physical computing platform. You can start prototyping real world spimes with it. Small enough to turn into wearables and embed into objects. You can now make active objects that control virtual objects in the 3D world. He shows a board linked to an object in second life. Physical gestural instructions from a bluetooth object in the physical environment leads to a script in the virtual world. Where is the crossover between art and programming? Those who know how the interact with a human through a browser don’t know how to interact with switches and sensors. He uses Schultze and Webb as an example of designers taking software ideas into the physical world. Can we map real objects onto a virtual world that is a 1 to 1 relationship to our own? IBM is projecting the physical world into the virtual world. And projecting the web into second life. Andrew Reynolds wrote a connection between the tilt sensor in his laptop to his virtual laptop. A simple mapping of presence. IBM also does sports telemetrics in Wimbledon. They took the data sets and you can now watch replays of Wimbledon matches with floating tennis balls. 1 to 1mapping of coordinates in the real world. This was written by Joshua. Posted on Friday, February 23, 2007, at 1:01 am. Filed under Uncategorized. Bookmark the permalink. Follow comments here with the RSS feed. Post a comment or leave a trackback. I’m delighted Matt used my simple tilting laptop demo as an example of RL SL data-mapping. Did he demo his d Arduino hack live? If you’re interested in the Wimbledon (or even the later Australian Open) project with the tennis ball tracking stuff, let me know. Yeah, it was a nice moment for Matt to use your tilting laptop demo as an example of the mapping of RL on SL. Matt did a semi-live demo of the arduino hack, showing a split-screen side-by-side RL SL video. Would have been great if he did it live! And I would certainly love to hear more about the tennis ball tracking stuff. In light of the new gender parity in winnings, I am wondering what qualitative data can be generated from the ball tracking which would give winnings based on performance freed from body, rather than victory.